The small aircraft disappeared over the English Channel on 21 January while travelling to Cardiff from Nantes, with authorities initially unable to find any trace of the plane, of Sala or the pilot, David Ibbotson. But on Sunday, David Mearns – the coordinator of a privately funded search – confirmed a wreckage had been discovered, identified as the missing Piper Malibu plane. A remotely operated vehicle (ROV) conducted a further search of the area overnight on Sunday, and the AAIB says footage shows one of the aircraft’s occupants in the wreckage. An AAIB statement on Monday read: ‘Having identified a priority search area last week, the AAIB agreed a search strategy with Blue Water Recoveries Ltd to maximise the chance of locating the aircraft wreckage. ‘The AAIB commissioned specialist vessel Geo Ocean III and Blue Water Recoveries Ltd commissioned FPV Morven, and the search area was divided between the vessels. Both vessels began their search on the morning of Sunday 3 February. ‘Early in the search, the Morven identified an object of interest on the seabed, using its side-scan sonar equipment. ‘It cleared the immediate area for the Geo Ocean III to use its underwater remotely operated vehicle (ROV) to survey the area of the seabed where the object was located. 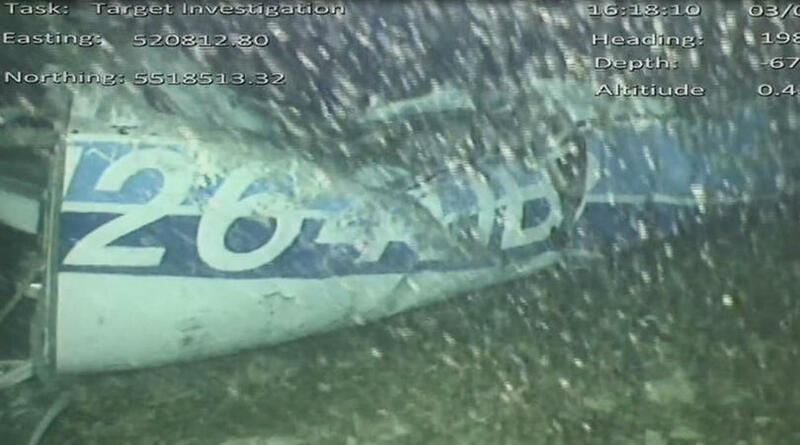 ‘Based on analysis of ROV video footage, the AAIB investigators on board the vessel concluded that the object is wreckage from the missing Piper Malibu aircraft, registration N264DB. ‘The ROV carried out a further search of the area overnight, but did not identify any additional pieces of wreckage. ‘Tragically, in video footage from the ROV, one occupant is visible amid the wreckage. The AAIB is now considering the next steps, in consultation with the families of the pilot and passenger, and the police. It is 11 days since Guernsey Police ceased looking for the aircraft, which was carrying Sala, 28, back to Cardiff after he had said goodbye to former teammates at Ligue 1 side Nantes. Guernsey harbourmaster captain David Barker called their chances of survival ‘extremely remote’, but a number of high-profile football figures and members of the public answered the family’s calls to fund a private search operation headed up by Mearns.